NSF's task of identifying and funding work at the frontiers of science and engineering is not a "top-down" process. 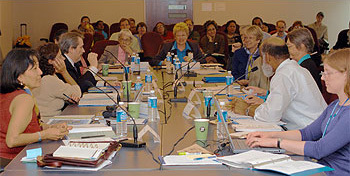 NSF operates from the "bottom up," keeping close track of research around the United States and the world, maintaining constant contact with the research community to identify ever-moving horizons of inquiry, monitoring which areas are most likely to result in spectacular progress and choosing the most promising people to conduct the research. NSF funds research and education in most fields of science and engineering. We do this through grants and cooperative agreements to more than 2,000 colleges, universities, K-12 school systems, businesses, informal science organizations and other research organizations throughout the U.S. The Foundation considers proposals submitted by organizations on behalf of individuals or groups for support in most fields of research. Interdisciplinary proposals also are eligible for consideration. Awardees are chosen from those who send us proposals asking for a specific amount of support for a specific project. Proposals may be submitted in response to the various funding opportunities that are announced on the NSF website. These funding opportunities fall into three categories -- program descriptions, program announcements and program solicitations -- and are the mechanisms NSF uses to generate funding requests. At any time, scientists and engineers are also welcome to send in unsolicited proposals for research and education projects, in any existing or emerging field. The Proposal and Award Policies and Procedures Guide (PAPPG) provides guidance on proposal preparation and submission and award management. At present, NSF receives more than 42,000 proposals per year. To ensure that proposals are evaluated in a fair, competitive, transparent and in-depth manner, we use a rigorous system of merit review. Nearly every proposal is evaluated by a minimum of three independent reviewers consisting of scientists, engineers and educators who do not work at NSF or for the institution that employs the proposing researchers. 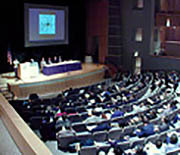 NSF selects the reviewers from among the national pool of experts in each field and their evaluations are confidential. On average, approximately 40,000 experts, knowledgeable about the current state of their field, give their time to serve as reviewers each year. The reviewer's job is to decide which projects are of the very highest caliber. NSF's merit review process, considered by some to be the "gold standard" of scientific review, ensures that many voices are heard and that only the best projects make it to the funding stage. An enormous amount of research, deliberation, thought and discussion goes into award decisions. The NSF program officer reviews the proposal and analyzes the input received from the external reviewers. 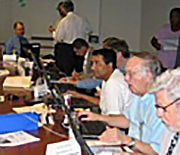 After scientific, technical and programmatic review and consideration of appropriate factors, the program officer makes an "award" or "decline" recommendation to the division director. Final programmatic approval for a proposal is generally completed at NSF's division level. A principal investigator (PI) whose proposal for NSF support has been declined will receive information and an explanation of the reason(s) for declination, along with copies of the reviews considered in making the decision. If that explanation does not satisfy the PI, he/she may request additional information from the cognizant NSF program officer or division director. If the program officer makes an award recommendation and the division director concurs, the recommendation is submitted to NSF's Division of Grants and Agreements (DGA) for award processing. A DGA officer reviews the recommendation from the program division/office for business, financial and policy implications, and the processing and issuance of a grant or cooperative agreement. DGA generally makes awards to academic institutions within 30 days after the program division/office makes its recommendation.